TheAngrySpark: How Will You Survive The Strain? We reviewed the first issue of the comic book adaptation for Guillermo Del Toro's The Strain novels right here. It's cool mix of horror ideas both new and old won us over- and now it may just kill you... in a metaphorical way of course. The plague is coming and we want to know how you will survive. Win a chance to get killed in the 2nd Story Arc of The Strain! We're making preparations for the coming infestation, storing food, comics and weapons. 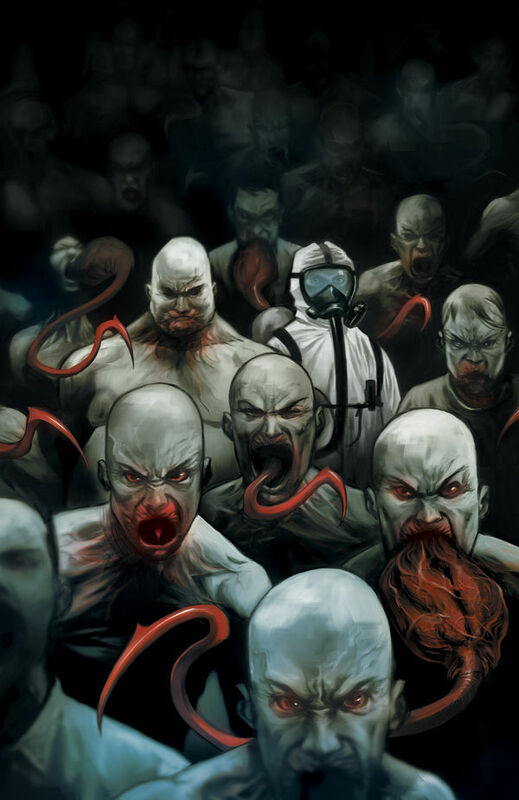 The Strain #1 is on its way, infecting comic shops on Dec. 14th. And here's a little contest to get you excited for the comics from Guillermo del Toro, Chuck Hogan, David Lapham and Mike Huddleston. We want to hear how you will survive the vampire plague. In the comments below give us at least a 200 word description of how you plan to survive the coming epidemic. What supplies will you need? Where would you go to hide? Who would be with you? What weapons would you need? Give us all the details, we need help figuring out how we'd survive. 1. Post a comment of at least 200 words on the Dark Horse Blog (http://www.darkhorse.com/Blog/741/strain-survive-plague-contest) by 11:59p.m. PT on Sunday Dec. 4th, 2011 and describe how you plan to survive the coming plague. The Winner of this contest will have their likeness drawn into one of The Strain arc two comics to be killed by a Vampire. We will finalize details with the winner individually. The fine print: No purchase necessary. One online entry per person (one e-mail address per person/address). You must be eighteen years of age or older to enter. Contest entries only accepted if they are submitted by 11:59p.m. (PDT), Dec. 4th, 2011, to be eligible. Winner will be selected based upon the quality of submitted comments (as determined at Dark Horse's sole discretion) from all applicable entries and will be notified by Dec. 13th, 2011. Entry becomes the property of Dark Horse upon receipt. Entry constitutes agreement by winners to be publicized and permission to use each winner's name for the purposes of promotion of the Contest without further compensation. Contest void where prohibited. Odds of winning dependent on number of entrants.